Thousands of containers of goods are shipped around the world every day in a global trading process so massive and complex, it can be hard to imagine. 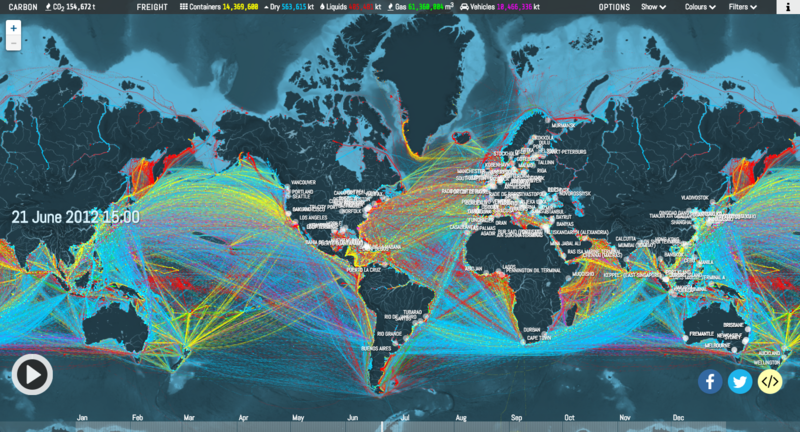 The map, based on research from the UCL Energy Institute, shows the routes of global merchant vessels carrying cargo in 2012. Statistics about the cargo itself, such as the number of container slots or weight of goods, are included at the top of the map. The routes of the ships are represented by lines criss-crossing the bodies of water, as seen in this zoomed-in view of the Great Lakes and the St. Lawrence Seaway. The environmental cost of global shipping is tracked too, with the carbon dioxide released by ships per hour visible in the top left corner of the map. 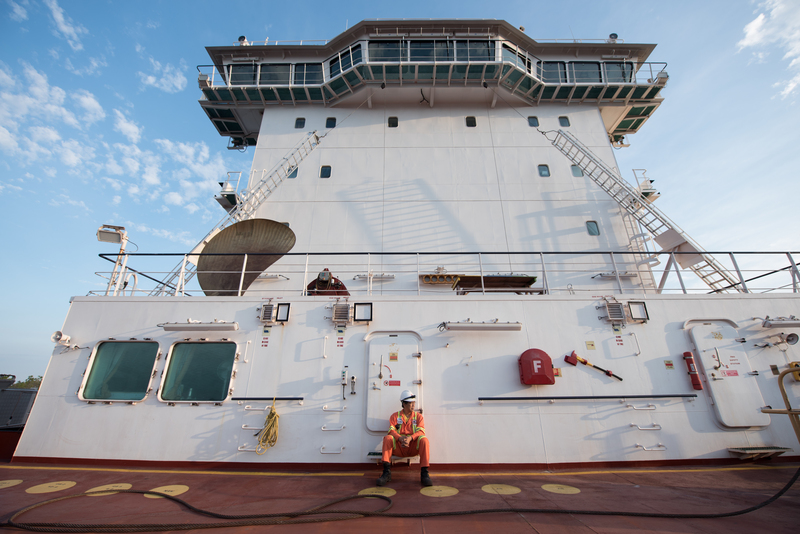 Colourful lines (shown above) distinguish between five different categories of freight: container (manufactured goods), dry bulk (coal, aggregates), tanker (oil, chemicals), gas bulk (liquefied natural gas), and vehicles. Users can also zoom in to examine different shipping routes and play with the timeline feature at the bottom of the screen to see how time of year affects distribution. 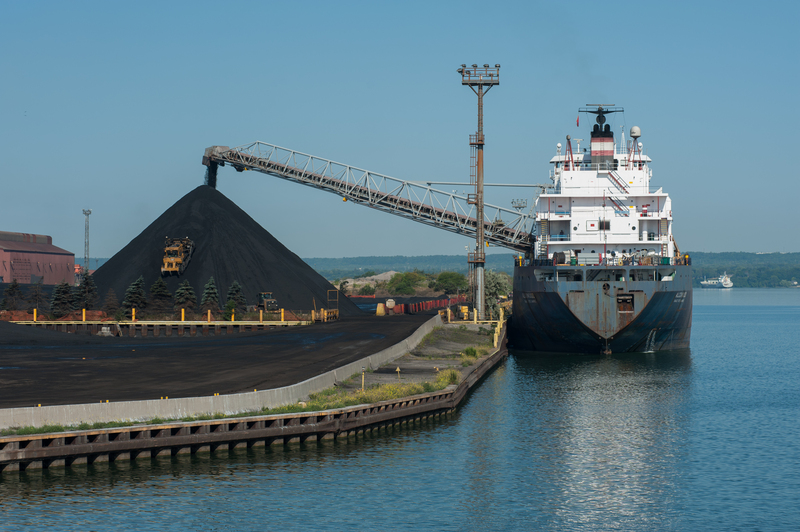 In central Canada, for example, ships move up and down the Great Lakes and the St. Lawrence River. The dots even pause, marking ports where the ships unload their wares and take on new cargo before moving back the way they came. While the dots on the map are small, each of them actually represents a very big ship with its own unique crew, cargo and stories. Pick up our July/August issue, on newsstands July 3, to read more about life aboard a giant "laker."